What is the mass percent yield from 2.57 g of Sb in excess S, if 1.56 g of Sb2S3 is obtained? What is ΔGo at 121 oC in kJ? Did you change to K and use consistent units? What is the oxidation state of Mn in KMnO4? Balance the following half-reaction in base, using smallest whole number coefficients. What is the coefficient for OH- in the balanced equation? Balance the following reaction in acid, using smallest whole number coefficients. What is the coefficient for H2O in the balanced equation? A stock solution of NaOH is 0.800 M. What volume of this solution (in mL) is needed to prepare 2.00 L of 0.091 M NaOH? What mass of copper (in mg) could be plated on an electrode from the electrolysis of a Cu(N03)2 solution with a current of 0.600 A for 47.1 min? What is E, if the pressure of oxygen gas is 1.0 atmosphere and the pH is 6.03? The activation energy for a particular reaction is 32 kJ/mol. By what factor will the rate constant increase when the temperature is increased from 50 oC to 67 oC? What is Kc for the reaction:2NO2(g) → N2O4(g)? What is Qsp if 100 mL of 0.062 M Mg(N03)2 is added to 50 mL of 0.030 M Na2C2O4? Recall that if Qsp is greater than Ksp, a precipitate forms. 2 L of an unknown concentration of the weak base ammonia are standardized. 50.0 mL of the basic solution are titrated with 0.200 M HCl. The end point occurs after 62.8 mL of acid are added. What is the concentration of ammonia in the 2 L flask? I. A copper wire was placed in a solution of AgNO3(aq). The copper dissolved and filments of silver metal grew on the remaining copper wire. II. A copper wire was placed in a solution of Zn(NO3)2(aq). No reaction was detected. III. An aluminum wire was placed in a solution of Zn(NO3)2(aq). The aluminum dissolved and Zn metal formed. Rank the activity of these metal. Which of the relationships is true for the transition from ice to water for an ice water mixture at 0 oC and 1 atm? A particular chemical reaction has a positive ΔH and a positive ΔS. Which statement is correct? a. The reaction is spontaneous at all temperatures. b. The reaction is nonspontaneous at all temperatures. c. The reaction becomes spontaneous as temperature increases. d. The reaction becomes spontaneous as temperature decreases. For which of these processes is the value of ΔS expected to be negative? a. Sugar is dissolved in water. c. CaCO3(s) is decomposed into CaO(s) and CO2(g). The side with more moles of gas has the greater entropy. In which process is entropy decreased? For an endothemic process to be spontaneous which of the following conditions is correct? Which laboratory measurement is expressed to the appropriate number of significant figures? Which statement is true for the following unbalanced reaction? A reducing agent allows something to be reduced, that is, it provides electrons. The student used atomsperic air (0.21 atm oxygen) and 1.0 M HCl (the presence of the acid increases the rate of the reaction). Unfortunately, the equilibrium yield of D was too low to be useful. Which of the following changes will improve the yield of D? Under certain conditions some substances, like MnO2, can act as an oxidizing agent; under other conditions, as a reducing agent. What is true for these substances? b. One of the elements must be a transition metal. c. The substance must be a stronger oxidizing agent than a reducing agent. Which of these ions is the best oxidizing agent? A quantity of a powdered mixture of copper and nickel is added to a solution containing Cu2+ and Ni2+ ions, each at unit activity (1 M). What reaction will occur? a. Nickel metal reduces Cu2+ ions to Cu(s). b. Ni2+ ions are reduced to Ni metal. d. Ni2+ ions oxidize Cu metal to Cu2+ ions. The reaction giving the largest voltage occurs. What is the standard electrode potential for a voltaic cell constructed in the appropriate way from the above two half-cells? Voltage gives tendency for something to occur and is independent of the number of electrons (doubling the number of electrons, that is doubling each half-reaction and adding gives the same voltage). This is not true about energy or enthalpy. Twice as much material, doubles the energy produced or the enthalpy change. What is the correct procedure for diluting an acid? a. Add the acid to water. b. Add the water to the acid. c. It is OK to add the acid to the water or the water to the acid. Acid is added to water to avoid splattering. More dense acid sinks as it is diluted and as heat is released. Less dense water stays on top, is less dispersed, and may end up boiling and causing splattering. What is a correct description of chemical equilibrium? a. The frequencies of reactant and of product collisions are identical. b. The concentrations of products and reactants are identical. c. The velocities of product and reactant molecules are identical. d. The rate of reaction of reactant molecules to form product is the same as the rate of reaction of product molecules to form reactants. M doubles (goes from 2 to 4). Rate increases by 2x2x2. a. direction of a reaction. b. extent of a reaction. c. quantity of reactant(s) remaining at equilibrium. d. time required to reach equilibrium. What is the correct expression for Kc? What is the correct expression for Kp? For the reaction: 2NO2(g) → N2O4(g), ΔH = -57 kJ. Which reaction characteristics will be affected by a change in temperature? For the reaction: A +2B +2C → 2D +E, the following table gives the initial rates of reactions for various concentrations. What is the experimental rate law? Consider this reaction, carried out at constant volume. a. O2 is added to the system. b. the temperature of the system is lowered. c. SO3 is added to the system. d. an inert gas is added to the system. LeChatelier's Principle (easy). The ACS Guide had many questions of this type. is carried out by mixing carbon monoxide and hydrogen gases in a closed vessel under high pressure with a small amount of a suitable catalyst. After equilibrium is established at high temperature, all three substances are present. Which of the following will increase the yield of product? What is the equilibrium constant expression if the initial concentration of AB2 is 1.0 M, the initial product concentrations are 0, and the equilibrium concentration of A is represented by x? What is the intermediate, if any, for the following proposed mechanism? Which of the following has an effect on the rate constant? a. Increasing the pressure of gaseous reactants. c. Increasing the area of a catalytic surface. The above change the rate, but not the rate constant. The rate constant is independent of amounts of reactant. Two reactions with different activation energies have the same rate at 1000 oC. Whic statement correctly describes the rates of these two reactions at the 950 oC? a. The reaction with the larger activation energy will be faster. b. 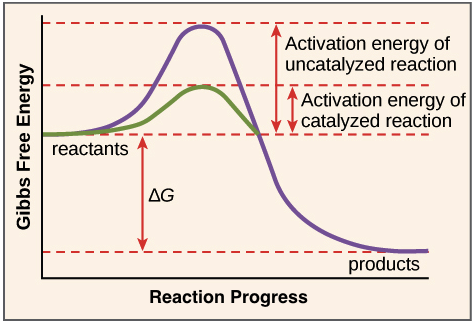 The reaction with the smaller activation energy will be faster. c. The two reactions will continue to occur at the same rates. d. A prediction cannot be made without additional information. The larger the Ea the faster the rate constant increases as T increases. Conversely, the larger the Ea the faster it decreases as T decreases. What is the overall reaction order for the above reaction? What is activation energy for the following reaction? Is it exothermic or endothermic? For the reaction: A + 2B → C if the concentration of A is doubled the rate increases by a factor of 4. If the concentration of both A and B are doubled, the rate increases by a factor of 4.
a. The reaction is second order with respect to A, and zero order with respect to B.
b. The reaction is first order with respect to A, and first order with respect to B.
c. The reaction is first order with respect to A, and second order with respect to B.
d. The reaction is second order with respect to A, and second order with respect to B. A plot of the log of the reactant concentration as a function of time gives a straight line. What is the order of the reaction for this reactant? Plotting using log or ln both give a straight line (different slope). Which molecule has the greatest entropy?